Model M-2C comes complete with: two strapbars, one 12V sealed long life battery, a battery cover, one two wheel retractable dolly, and one battery charger with auto shut-off and multi voltage feature, and one hook bar leveler. 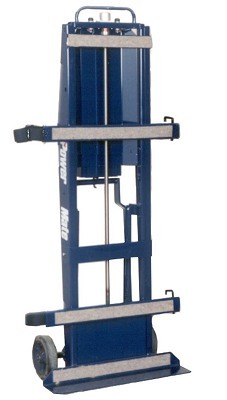 Above weights are based on qualified operators moving loads that have the weight evenly distributed all along the frame. Refer to the detailed loading specification chart on the back. Steps for matching loads to PowerMate® models and the number of trained qualified operators required to move the loads. Determine the weight of the load to be moved. Using the load area drawing, determine in which area (A-1 - through - C2) the centre of gravity is located. whether the load can be moved safely on flat surfaces, on stairs, on and off vehicles and on and off loading docks to low bed vehicles. the number of operators required to safely move the load.